Having time to totally switch off and unwind is such a rareity these days. I can't even tell you the last time I had a bath, or shaved my legs, or even touched half of my skincare regime. It's normally now all systems go for getting Eric ready for bed, sorting out all his things ready for the morning and then being left with maybe an hour in which you have to eat, catch up with each other and then settle down to watch one of the TV shows you have saved before you scuttle off to bed ready for the same routine to start all over again the next day. I have always been a lazy girl when it comes to skincare, but since being a mum things have gone from bad to worse. My face is in a terrible state, and to top it all I have gained a squatter on my chin! With a family wedding coming up my skin is in desperate need of some TLC, so I plan on putting on my current favourite cleanser from Elemis, then letting my skin soak up the goodness of a face mask for a precious few. Hopefully this will help the spot that has decided to take residence on my face disappear and help my skin get camera ready for all the photo ops the following few days will bring. The festive season is by far my favourite for Lush products. I have always been a big fan of the range and make it my mission to stock up on plenty of Luxury Lush Puds because there is nothing I love more than soaking in a roasting hot bath that makes my skin feel soft and leaves me smelling sensational. 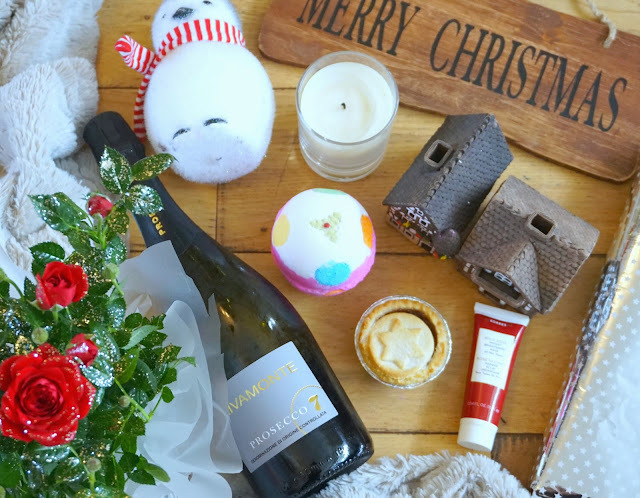 Add a chilled glass of something fizzy, a mince pie and a quick catch up on all my fave festive YouTube videos and I'm all set. After a bath, there's nothing quite like slipping into your favourite pyjamas and snuggling up on the sofa. And the year I've treated myself to a brand new set as most of mine were actually either borrowed from Ryan's wardrobe or maternity ones. They're only from Primark but are so soft and cuddly and are perfect for lounging around in and watching Christmas television. I naturally seem to have a schedule when it comes to watching Christmas films. I usually start off with Home Alone and the Santa Clause trilogy then build up to Elf (which I have to watch at least five times) and Scrooged. And whereas mulled wine is delicious, making it for just two people can be a bit of a faff, so instead I love curling up and keeping warm with a creamy hot chocolate. Turning off all the lights barr the Christmas tree ones makes the atmosphere feel extra magical. Undoubtedly I will nod off whilst before the end of the film we are watching before being woken up by Ryan and ushered off to bed to get ready for Santa to arrive.